The NBA is a dumping ground for the best athletes in the world. No other sport requires you to have a such a wide arrange of skills. Every player on the court must be extraordinarily fast for their size, be able to jump higher than James Franco was in Pineapple Express, and have the agility of an attacking Puma. 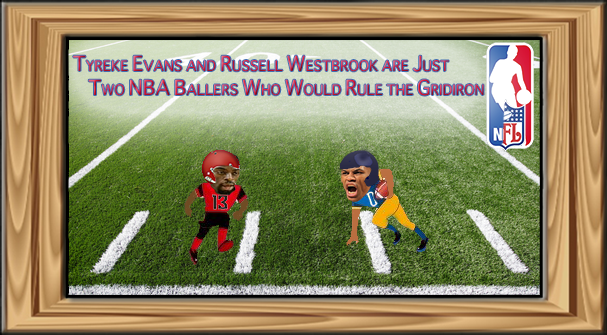 This skill set translates extraordinarily well to pretty much any sports this side of synchronized swimming, so with that in mind and Super Bowl Sunday looming on the horizon, let’s take a look at which NBA players would make the Gridiron their own. Explosive, powerful, can absorb contact and relentless in his approach. No, I am not describing Adrian Peterson, but rather the monster known as Russ West. Explosive and aggressive athlete who regularly blocks opposing big man at the rim. I want this guy toting the rock for my team. Rob Gronkowski is considered a physical freak at TE in the NFL. He is 6’6″, 265 with a 33 1/2 inch vertical. Blake Griffin is 6’10”, 250 pounds with a 35 inch vertical. Nuff said. If you need this explained to you, you probably don’t watch the NBA. Ditto. A 6’10” Randy Moss. Ty would dominate the slot. He has outstanding quickness and very good bulk for his height. Think a Victor Cruz type. George is a 6’10” athletic specimen with the size, speed and wingspan to be an effective edge rusher. Boogie Cousins weighs in at 270 lb but has the agility of a man half that size. He would eat OT and TE for breakfast, then have himself some Quarterback for a sack lunch. His size and athleticism would make him both fantastic at rushing the passer and dropping into coverage, ideal for an Outside backer. Smart, savvy, and a little dirty, Dwayne would be great at Wade-ing through traffic and finding the ball carrier. Would have to put on a few lbs to be up to being a MLB, but he has the frame to support it. Big, strong and fast. He would be a beast rushing the passer, and I can see him being a devastating hitter. I think his skill set translates better to Football than Basketball. Quick hands, incredibly fast, and a great basketball mind. Welcome to Con(l)ey Island. One of the quickest men in the league who is also adept at fighting through traffic, and acrobatic in finding ways to finish at the rim. Would make a great slot cornerback. Jrue packs a lot of punch. His aggressive drives to the hoop parlay well into beelines to a running back. He has the speed and hops to play a mean centerfield as well. Tony Allen is nasty. He would be the intimidator of this unit, delivering jaw-breaking hits and intimidating WR crossing the middle. i like all of these except paul george at DE. sure he’s big and long but i doing think his frame can pack on the necessary lbs to battle with the 300 lbs tackles. I like melo (6’8 235) or jsmooth (6’8 240) at DE. both of them have a really quick first step and have a frame that could easily pack on 20 more pounds of muscle.